Posted on November 23, 2012 by Alicia Bay Laurel	in Blog, Recipes. I have evolved this recipe over many holiday seasons. Measure and then chill the coconut oil. Place it in a food processor with the flour and an ice cube. Blend until it forms a soft ball of dough. If it doesn’t form a dough ball while blending, very gradually add a tiny bit more cold water. As soon as it gets the right amount of water, it will form a soft ball of dough. Flatten the ball into a disk and press into a 9 inch glass or ceramic pie pan so that it is of even ¼ inch thickness all over, and form a scalloped edge with your thumbprints. Make fork holes every ½ inch all over the bottom and sides of the pie shell. Bake at 375 Fº until golden, but not brown. If you have extra dough, form it into a cookie shape (star, heart, tree, etc.) in another pan, make fork holes every ½ inch on it, and bake it along with the piecrust. 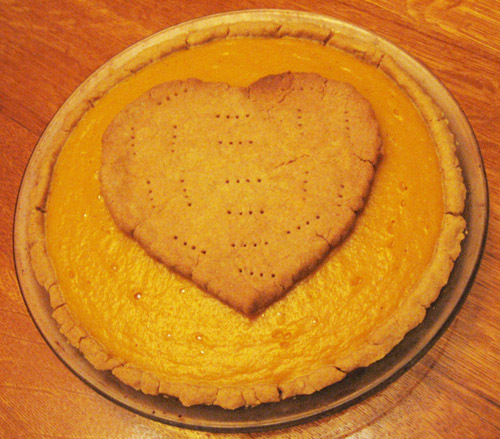 After the filling has chilled and become firm in the crust, place the cookie shaped piece of piecrust on top of the filling. For ease of handling, I suggest forming and baking the cookie shaped piece on top of a piece of baking parchment, so that you can easily slide it onto the top of the pie without it crumbling in the process. In a (clean) coffee grinder, powder one cup each of walnut meats and raw cashews. Remove pits from 6 dates, chop them well and place them in a food processor with the nut flours. Blend until it forms a soft dough. Press the dough into a 9 inch glass or ceramic pie pan. Keep the edge small and simple, since an extended, scalloped edge will crumble off when the pie is cut and served. Chill in the refrigerator. If you’d like to make a decorative raw cookie for the top of the pie, take some of the nut/date dough, form into the shape of choice, and dehydrate at 105 Fº until almost crisp. Cut a medium sized butternut squash or small kabocha (green) pumpkin into pieces about 1 to 2 inches on a side. Peel two thumb-sized pieces of fresh ginger and chop into small pieces. Steam the squash and ginger until soft and let them cool until you can easily pick up one of the squash pieces with your (clean) hand, at which point you can spoon the flesh out from the shells into the food processor bowl, and compost the shells. Then dump the steamed bits of ginger from the steaming basket into the food processer with the squash, and blend until smooth. If the mixture is so thick that it bogs down the food processor, slowly add a tiny bit of the cooking water, until the blades are moving easily. After blending, just to be sure there are no annoying bits of ginger in the pie filling, pour the mixture through a sieve into a large bowl, and stir with a wooden spoon to complete the separation. Simmer for 5 minutes, stirring constantly: one cup of unsweetened, non-flavored vegan milk (hemp, almond, rice, soy, or, if you’d like a very rich pie, coconut cream) with 2 teaspoons of agar flakes, 1 tsp. cinnamon, ½ tsp. nutmeg, ¼ tsp. cloves, ½ tsp allspice) and 3 droppers of non-flavored stevia glycerite, stirring until the agar is completely dissolved and the spices are well blended into the milk. Place the food processor: the butternut squash and the agar/milk mixture. Blend until completely smooth. Pour the filling into the pie shell and chill until the agar is set (at least one hour, although you can make this pie the day before serving it and keep it in the refrigerator until then). If you have more filling than pie shells, pour it into custard cups and chill. A nine-inch pie will serve 8 people. Coconut Bliss vegan ice cream (Naked Coconut flavor) would be my choice, but there are also excellent choices available from Tofutti, So Delicious, and other vegan ice cream brands.